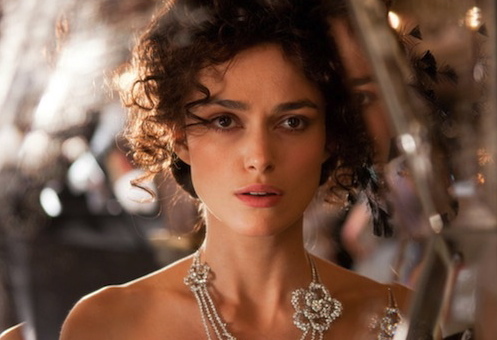 Well, folks… I finally made it to see Anna Karenina. Originally, I would have placed an emphasis on “finally” because I was plowing through the 5-pound book in time to see it and it seemed the 800th-something page would never come, but alas after weeks of literally reverting my Lasik Surgery from so much reading, I caved and saw it anyways. To be straight and logistical (because the movie is none of that), this film plays out like a musical, but without the singing. It mimics a quirky touch of Wes Andersen, but performs as though on stage at an Italian (well, I guess I would have to say Russian) Opera. It’s mesmerizing. Simply, mesmerizing. I admit, it take a few uncomfortable giggles and imaginary questions marks above my head to really settle in, but once Knightley steps out as Anna in a delicate veil and explicit freshness, it’s a journey well worth taking. She’s the perfect fit for this role. Elegant, yet simple. Daring, but vulnerable. She has the natural beauty that makes Vronsky’s rapture so believable. And, when she dons the deep V-back black ball gown for the ball, I myself am quite smitten. Never before have I been so drawn to jewels and regality. Honestly, I am shivering again now just thinking about it. Aaron Taylor-Johnson (he was the slimy “Joe” in Albert Nobbs) plays a seductive Vronsky, proving that how much he annoyed me in his previous period-piece role, he does, in fact, have what it takes. And, at only 22 years old (sigh), he captures a perfectly mixed recipe of emotion embodying both understated maturity and play-boyesque flippancy. I will admit right now that I absolutely do not find him attractive (sorry, Anna), but his aire works the role to a T, and for that I offer my props. As far as the other (hundreds of) players, Matthew MacFayden as Oblonsky steals the show and provides the film’s much needed comic relief. Ruth Wilson rules the world of trash (as a bleached out blonde, of course) and the duo of Domhnall Gleeson and Sweden’s Alicia Vikander as Kitty and Levin delivers the film’s most touching romantic moment. It’s an incredible sight to see–this true, undaunting, truly innocent and genuine love blossom in contrast to the dark, doomed affair of Anna and Vronsky. It is one of those moments you wish you had in your own life… you know, the life where you think you’ll live out some sort of fairy tale. Overall, this movie strikes an unique chord in the heart of any artist and/or literary fan. Yes, it’s a little dramatic and very much different than your usual 18th Century story told on screen… But it succeeds, nonetheless and is without a doubt worth seeing. Here’s to the Oscar Race – Best Actress, Best Picture, Best Costume Design, Best Original Score.